While most European Union (EU) citizens find their own solutions to housing in older age, a significant minority will always need help. Providing decent and secure homes for this group of older people has long been at the centre of the work of social housing organisations in the European Union. As the Millennium approaches their minds are concentrated by the increase in the number of older people in Europe, which has been described by the EU as the 'most important social phenomenon of the late 20th century'. The proportion of very old people in their 80's and older is increasing significantly and with it, the number of people with dementia and physical difficulties. Against this background, EU members are faced with the challenges of financing state retirement pensions, stretching social care budgets and providing shelter for older people whose expectations are rising. Social housing organisations in the EU are rising to this latest challenge. In a report produced by CECODHAS, the European Liaison Committee for Social Housing (with funding from the UK-based Joseph Rowntree Foundation), to mark the United Nations' Year of Older Persons, one of the Main Recommendations is that Governments and providers should help people stay in their communities. St Brendan's Village, Mulranny, Ireland, and the SLE Habitat extra-care scheme in Lille, France are, according to this Report, 'good examples of projects built to meet local needs that keep older people in the communities where they have spent most of their lives. Residents have the support of family and friends in familiar surroundings'. 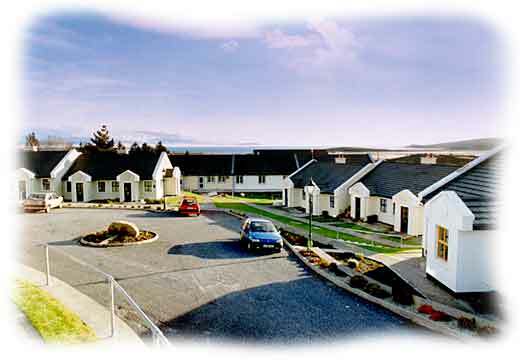 St Brendan's Village is a community response to the needs of older people living in the village of Mulranny and the surrounding area on the west coast of Ireland, where more than 30% of the local population is aged 65 or more. Residents are from the surrounding area and local care homes. Several are emigrants who have returned from the UK.